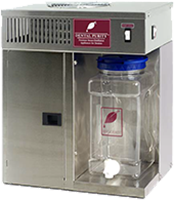 The DP360 Steam countertop dental distiller machine is perfect for smaller dental offices. Just plug in teh DP360 and it's ready to go. The DP360 is as easy to operate as a coffee maker. Fill the boiling tank with tap water, turn on and it will make about 3 liters of distilled water per batch. The DP360 is built to last in the United States with only the highest quality components and very little maintenance. The DP360 allows you to take control of your own supply of pure, steam distilled water. No more running out of distilled water at the last minute, trips to the store, or wasted bottle storage space. The DP360 is as simple to operate as a coffee maker. Simply fill the boiling tank with tap water, turn the unit on and it will produce 3 liters of distilled water in about 3 hours. For 40 years, dentists around the world have used our premium steam distillation appliances (under different brand names) to ensure that they are using the highest quality water at all times. According to the American Dental Association, dental unit waterlines have been shown to harbor, in signifi cant numbers, a wide variety of bacteria, fungi, and protozoans. New autoclaves and Statim machines require pure distilled water on a consistent basis or they will not operate properly and their lifespan could be shortened. Dentists should use only pure, steam-distilled water in their Dental Units and autoclaves.